This isn't really much beyond a cool little test I was doing for a spy game idea I have. I've been bumming around trying to find a way to achieve this, and finally, after a good 3 months of thinking, I was able to do it. This makes me glad! I have done a bit of a write-up over at my blog, but if you want to just download it, you can grab it here. The blog post is here, and has more details! Your signature has been erased by a mod as it is far too big. I think people want some more before they comment? Cheers Cliff. I wish we had simple polygonal geometry in AppGameKit, as all of this would be much easier! As is stands though, it works pretty well, and is nicely scalable. As a problem solving exercise, this was a WHOLE heap of fun. Really enjoyable. The next step will be to add it into the concept scene that is in the blog post. I'll be a case of building the scene from the transparent images, and creating a level hit-box. I can't see that being too hard. UPDATE: I've added the level, and changed the controls to be physics based. It's getting a LOT closer to what I wanted, and soon will have some gameplay in it! It seems nice, but those rays are still kind of visible. Meaning, you can't do true light (?). Like flashlight. @ kamac - Yeah, this is with the debug mode turned on, else it wouldn't be visible. 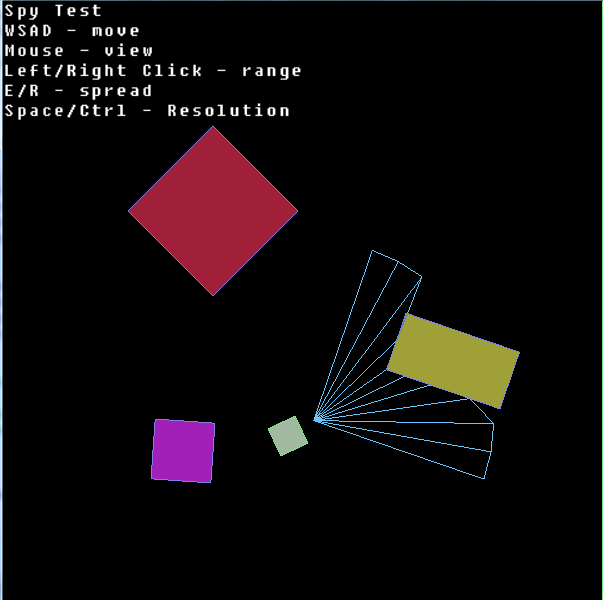 It won't have this in the final version, but for now it shows clearly the FOV, which is the point I guess! Ah, now that's interesting. I've been vaguely fiddling with something similar myself, although actually for lighting in a tile based game. Looks like your method is rather different. Any idea what sort of frame rates you get on phones with yours (and which phone if so...)? I like the look of this a lot greenlig! Your artwork is excellent as usual. You could add a flashlight to this if you wanted by adding a fading to transparent image to each ray sprite. You'd need to make the sprites wider but by doing that and using it as a mask on a black image you could have only where the flashlight is pointing visible. It would be slow using getImage but you could speed that up by only grabbing the visible area. Just an idea expanding on kamac's thoughts. Thanks for the kind words, guys. The art was a really quick concept, and I have some cool ideas to make it even more interesting. AGK's particle systems are going to be sweet with this! Although, the lack of particle collision is a bummer. Well, at the moment it's running in debug mode. Without that, you can't see them. I could do a system that used rotated and scaled sprites, but it's just not efficient at the moment. When we get control of simple geometry, this will all change, of course, and making this stuff will be a breeze. EDIT - Just read and understood what you meant, Baxslash. It's been a long day. I really like that idea! It could actually create quite a cool lighting system like that...I might try that down the track! @ Matneee - I tried it on my Galaxy S2, and had no problems with it at all. I'll add a frame counter and see what rate I'm getting. Raycasts are quick, so it shouldn't be an issue. Quote: "Although, the lack of particle collision is a bummer." Thanks for the offer! I'll give it some more thought, and get back to you on that. It's a little bit further down the road yet. I have a few ideas for the game, mostly multiplayer, so once that is in, I'll start making the visuals really sing. For now, I need all the sleep! Quote: "Thanks for the offer! I'll give it some more thought, and get back to you on that." Quote: "For now, I need all the sleep!" Me too, my 10 week old has other ideas though! Very nice artwork, I like this graphic style! What software do you use? UPDATES! I've added a few major things in this version. Actually, more than two can connect, but hey, it's early days yet. You need to have the port 25565 open if you host, and the host IP if you are joining. - Visibility! If the player is in your view-cone, you can see them. If not, they are invisible. Turn Debug of and on with "Q". 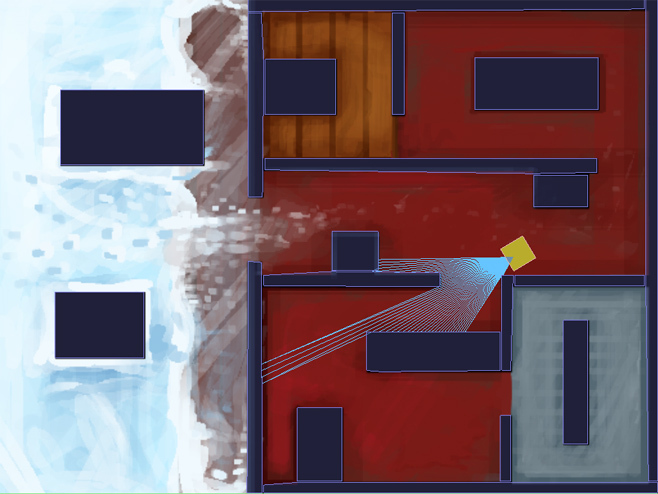 It's been tested a bit, and you can actually modify the level design if you work it out It's pretty simple. My brother has made another map that is fun to play hide and seek in. I'll upload that when I do a proper release for this. Feel free to modify the media in the file. Just be careful to keep the file-names the same, and don't add any more just yet. I'll get around to changing it so that it can read in all the media files in that folder. It's on the list. Next on the list is throwing knives, and a simple FOV display for non-debug mode. Probably won't have time for that till next week though. @DArt_LV - Cheers mate. I use Photoshop, and paint with the pencil tool instead of the brush. Makes it look more pixely. Still use pressure-sensitive transparency, so I can get the nice blended look. This is looking really promising Are you only doing multiplayer or will you make a singleplayer mode as well? From the looks of it I would say a thief or spy themed game would be sweet. Get the gameplay right and this will be a fun game to play.